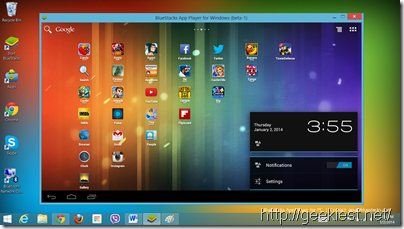 Days are nor far when we will enjoy full Android OS experience on a Windows PC. In a recent move AMD announced its collaboration with BlueStacks in a bid to offer complete Google Android OS experience on Microsoft Windows- based tablets, 2-in-1s, notebooks and desktops. This move by AMD shouldn’t be a surprise as their association with BlueStacks goes back to October-2011 when AMD invested an undisclosed amount in BlueStacks through its AMD Fusion fund program. 4. Seamless interoperability through direct file sharing that enables Android apps to access files stored within the Windows file system. Windows and Android are both mature operating systems, each satisfying the needs of millions of users. Users whose devices and preferences span the two ecosystems no longer have to face device-specific restrictions on the benefits of one ecosystem or the other because AMD and BlueStacks have created a seamless user experience between the operating systems. Now users have access to all the apps -- games, communications and content consumption -- they love on their Android mobile devices right at their fingertips, while getting important productivity tasks or high-end PC gaming accomplished on their Windows PC. Also BlueStacks CEO Rosen Sharma said that the collaboration with AMD is to build the next great PC, and AMD's hardware will allow for a more flexible experience with Android apps on the PC for end-users. Given the popularity of both Android and Windows, I’m sure that AMD-BlueStacks collaboration will make our life more easier and productive. Do share your thoughts (though comments) on this collaboration.